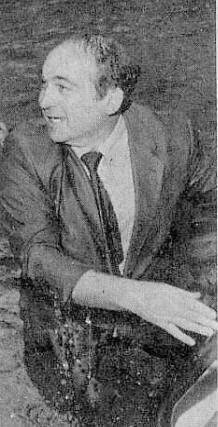 Helped by some of his pupils, Mr Don Feltwell takes the plunge in the new pool and, right, makes a dignified but dripping exit. 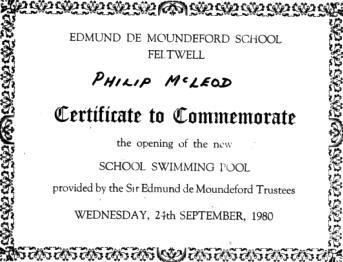 Feltwell De Moundeford school swimming pool opened with a splash yesterday as the headmaster tumbled in. It was all in good, clean fun as the aptly named Mr Don Feltwell took an early bath in front of staff, pupils and school managers at the official opening. The heated indoor pool, 60 ft by 25 ft. and up to 5 ft 6 in. deep, has been paid for by the Sir Edmund Moundeford charity trust. It cost over £80 000. The chairman Mr. E. W. Porter handed over the building's keys to the chairman of Norfolk Education Committee, Mrs Judith Walpole, yesterday. She in turn told parents, staff and pupils: "I am particularly pleased that the pool will be used by other schools and by the community." Mr Feltwell said he had formed a swimming association in the village and already 170 people had come forward to use the pool after school hours. 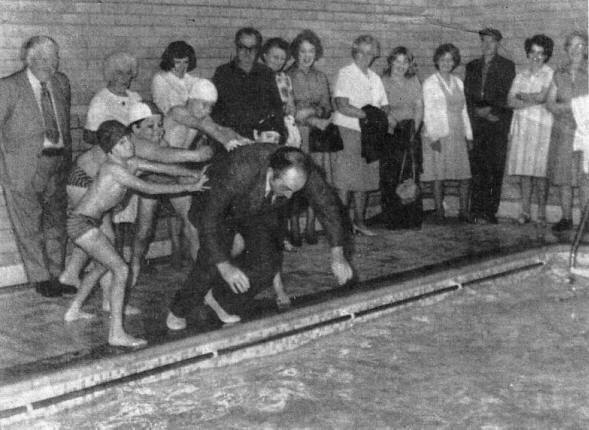 The pool, built be Anglia Pools Ltd., of Norwich, will hold up to 30 people at one time and pupils from Hockwold and Methwold have been invited to use it regularly. It has been paid for by the Trustees who manage 560 acres of fenland. Mr Porter said it was their biggest project to date, although they had provided office equipment at the school previously. Credited to a local paper, title unknown.